The core members are mainly computer science and cryptography experts from China and the United States. Ph.D. in Computer Science from the Huazhong University of Science and Technology, visiting scholar of University of California, San Diego. His research interests are in blockchain systems, distributed systems and parallel programming. Worked at Microsoft Research Asia and Megvii before. He is Research Director of Nebulas. Postdoctoral Research Scholar in the University of California, San Diego. Ph.D. in computer science, graduated from the Chinese Academy of Sciences. Got BS degree from University of Science and Technology of China. Founding Engineer and project manager of Whova for 7 years. Samuel is an enthusiast of new technology, and is aiming to create a great product which can change the world. Chief Architect of Nebulas, responsible for the development of important core infrastructure and platforms such as the mainnet and virtual machines. Ph.D. dropout from UC San Diego focused on operating system and system reliability, got a Master's degree in computer science from Tsinghua University, interested in parallel computing and distributed systems. He won the first prize in the NOI Informatics Competition and participated in the performance evaluation of several Chinese supercomputers. 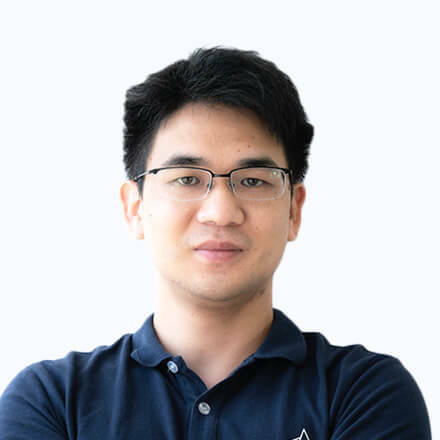 He is the Ecosystem Developing Director of Nebulas, responsible for the ecological development, cooperation and landing. Ph.D. from Huazhong University of Science and Technology, visiting scholar at the University of Aizu and the National Telecommunications Institute of Paris. His research interests include distributed systems, wireless networks and blockchain consensus. He has published papers in top journals such as TPDS and ICDCS. He is a senior researcher of Nebulas. Ph.D. in Institute of Interdisciplinary Information from Tsinghua University, visiting scholar at the University of Michigan, Denmark Aarhus University, and got a BS degree from the Computer Science Experimental Class of Tsinghua University. He won the gold medal in the China Mathematical Olympiad (CMO). His research interests are game theory and mechanism design, and he has published many papers as the first author at international top conferences such as EC, AAAI, and AAAMAS. Now he’s a researcher at Nebulas, and studies mechanism design issues on the blockchain. Master of Computer Science, Zhejiang University. Former Dolphin Browser R&D Engineer, former Tencent R&D Engineer, former Huawei R&D engineer, and is currently working as a R&D engineer at the Nebulas Research Institute. Evan Cheng bootstrapped the LLVM effort and led its development during his 10 year career at Apple. He was the co-recipient of the ACM Software System Award in 2012 for his contribution to computer science. He is currently an engineering director at Facebook, responsible for blockchain, developments in programming languages and runtimes. Assistant Professor at IIIS, Tsinghua University. Ph.D. in CS at the Hong Kong University of Science and Technology (HKUST). Post-doc research on AI, economics, and computation & game theory at Carnegie Mellon University (CMU). Research focusing on the interdisciplinary topics between AI and Game Theory, as well as its applications in e-Commerce, blockchain and internet advertising. Had multiple collaborations with industry and publications recognized by academic awards. Lei Liu is an Associate Professor of Computer Science at Institute of Computing Technology (ICT), Chinese Academy of Sciences (CAS), where he leads the Sys-Inventor Lab. Ph.D. degrees in computer science from ICT. He has led research projects that have advanced the state-of-the-art in Memory Systems, OS, Performance Isolation, and Profiling. As the leading author, Lei has published research articles regarding the architecture and operating system in venues that include ISCA, PACT, IEEE TC, ACM TACO, and others. Lei Liu is an IEEE and ACM member, has served as the PC/ERC member, chairs and session chairs for a number of main stream conferences and reviewer for well-known Transactions. He received a number of awards. Postdoctoral in the Blockchain Laboratory of Guanghua School of Management, Peking University. Ph. D. in School of Electronics Engineering and Computer Science from Peking University. His research interests include but are not limited to structured deep learning, blockchain theory, the application of large scale related networks in financial technology. He applied for 4 blockchain related patents and has published more than 10 research papers, including two CCF A papers, with hundreds of Google citation. He has been a research assistant at Nanyang Technological University, Singapore Management University, Shenzhen Institute of Advanced Technology. Associate Professor in the University of Aizu, Japan. Got MS and Ph.D. degrees from the University of Aizu, BS degree from the Huazhong University of Science and Technology. His research interests mainly focus on cloud computing, Internet-of-Things, blockchain, big data systems, as well as related wired and wireless networking problems. Dr. Li has published over 70 technical papers. He won the Student Excellent Research Award of the IEEE Communication Society Sendai Chapter, the Young Author Award of IEEE Computer Society Japan Chapter, and the Best Paper Award of IEEE TrustCom. He is a member of the IEEE.